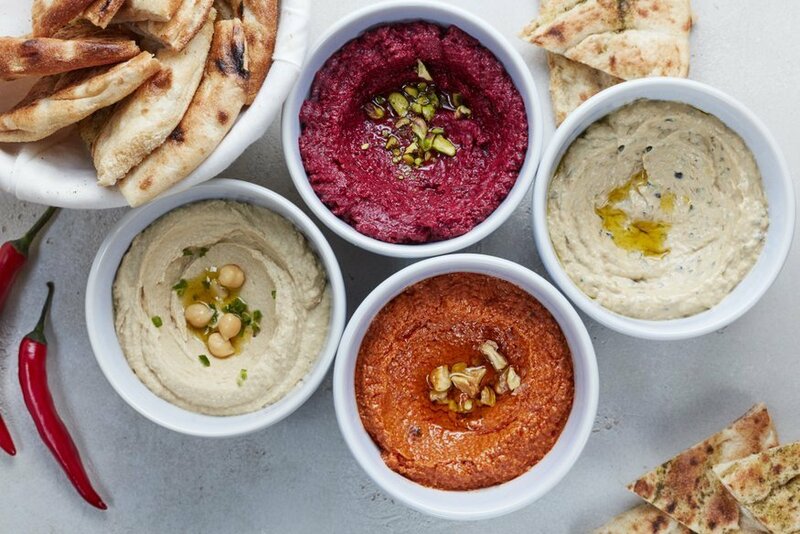 A fantastic selection of dips — we have a new favourite in the Fadi. As we step out of the sun into a restaurant whose décor is summer yellows and tiled patterns, we could easily be somewhere near the Mediterranean Sea, and if it weren't for the white van across the street we'd forget all thoughts of Soho entirely. We're here to have lunch at the second branch of Levantine restaurant Ceru — the first is in South Kensington. Ceru started out life as a pop up (we reviewed it back then) but we're here to see if it's remained just as vibrant. Nobody has ever gone wrong with houmous so we start there, but as lovely as it is, it must take a backseat to the Fadi, a dip made from courgettes, garlic, lemon and tahini that is zesty and flavoursome. We're big houmous fans, but it's time for it to step aside as we've found a new favourite. A perfect crisp salad for a summer's day. 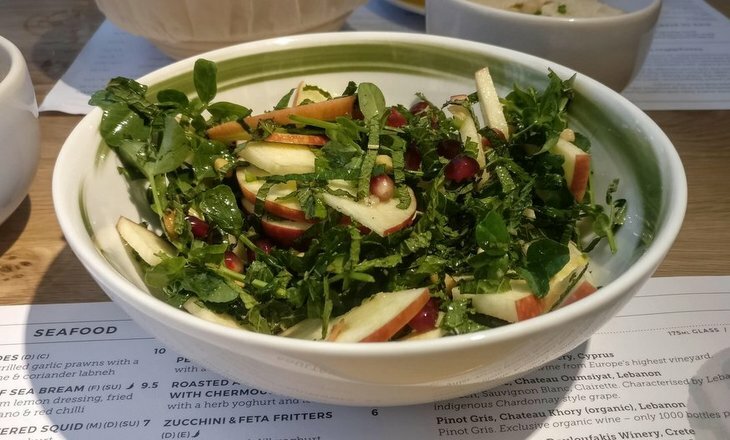 The crisp apple, mint and pomegranate salad is an ideal lighter accompaniment to our dips, particularly refreshing on the hot, sunny day of our visit. If that's not refreshing enough, there's a good selection of fruity alcoholic and non-alcoholic drinks to keep us hydrated. We recommend the passion fruit mojito in the mocktails section — after all, we all have to get back to work after lunch. It's at this point that the dishes start piling up and we're spoilt for choice. You know you've hit the mezze jackpot when you're surrounded by tasty looking dishes and have no idea which one to try next. The skewered chicken is sufficiently succulent. The meat dishes are superb, including some succulent beef and chicken, with a special mention for the squid. The addition of light spices giving the batter a zing that's been missing in other squid dishes we've tried elsewhere. Veggies needn't worry, as they are well catered for here. 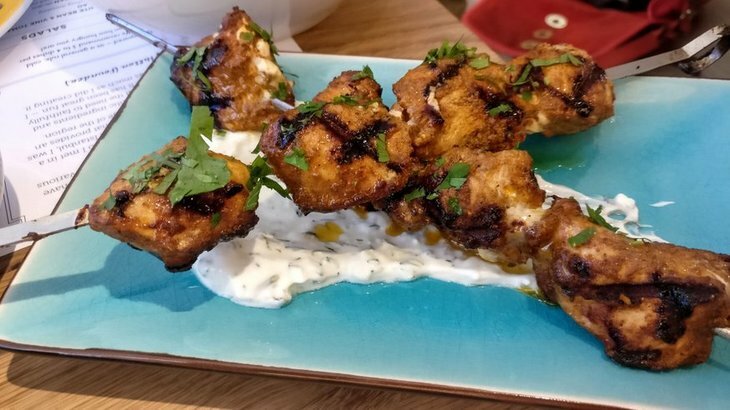 The courgette and feta fritters manage to surpass the meat dishes in having the right blend of spices and a light and fluffy texture that places them above the chicken cubes and beef kafta for us. The courgette and feta fritters surpass the meat dishes. Dessert is a surprise — the baklava doesn't look like any baklava we've had before. Concerns are quickly allayed as the crumbly pieces replicate the feeling of popping candy in our mouths, and the lightly flavoured cardamom ice cream works well with it. It's always risky to work with cardamom as it can often overpower anything else, but that's not the case here. We tried a whole host of dishes but the strongest compliment we can offer is that even though we're stuffed when we leave, there are still dishes on the menu we wish we'd tried — looks like a repeat visit is on the cards. Ceru, 11 D'Arblay Street, Soho. The meal in this review would cost circa £25 a head excluding drinks.